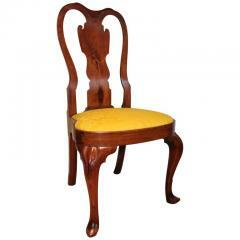 "A chair is one of the most definitive forms of furniture and a true expression of design and creativity. Great chairs have great lines. This applies to any period or style. 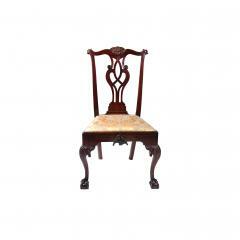 If there is a chair you are looking for and do not see, please call or email, we may not have cataloged it yet." 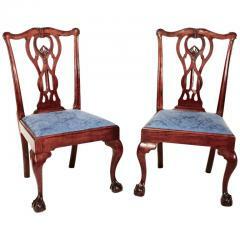 Pair of mahogany Chippendale side chairs. Relief carving on the crest, pierced splat with unusual carving, cabriole legs with shells on the knees, terminating in claw and ball feet. Nice old surface. 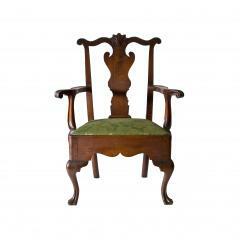 A wonderfully diminutive English or Irish easy chair with very nicely carved legs terminating in claw and ball feet as well as shaped back legs. 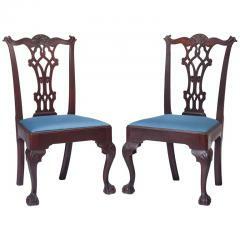 Pair of Baltimore mahogany Chippendale side chairs with wonderfully carved crest rail and pierced Gothic splat with molded stiles cabriole legs terminating in claw and ball feet. 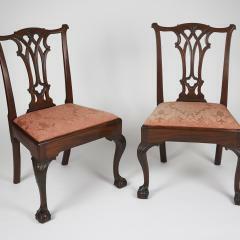 Rare pair of walnut Queen Anne side chairs with carved shell on cupids bow crest rail solid splat a shell carved on front rail and tulip style carving on the knees cabriole legs terminating in trifid feet. Made in Bucks or Montgomery County PA.
Walnut Queen Anne corner chair with a wonderful old patina, pierced splats with hearts, deep scalloped skirts with turned arm supports and three turned legs with one front cabriole leg terminating in a Trifid foot. 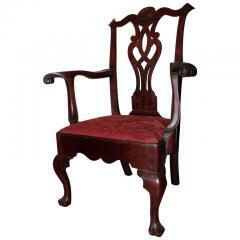 Walnut Chippendale armchair with carved shell and streamer crest rail solid splay with inlaid heart carved legs with flowers on knee blocks and terminating in claw and ball feet. 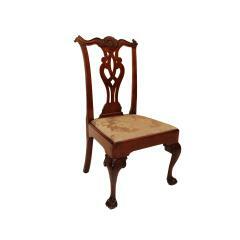 Philadelphia walnut Queen Anne balloon seat side chair with Savery style knees terminating in slipper feet. 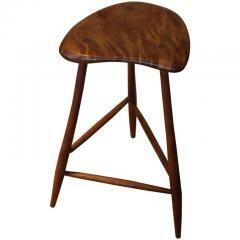 Stool with cottonwood crotch seat and hickory legs signed W.E. and dated 1958 and still retaining its original paper label underneath for Esherick's studio in Paoli PA.
Cupids bow crest with a carved shell pierced splat and bold arm supports ending in carved knuckles with cabriole legs terminating in trifid feet. 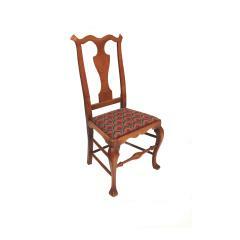 A very fine Chippendale side chair with a great old patina multiple shells on the crest rail and knees with wonderfully carved volutes on crest rail and knee blocks, fluted stiles and cabriole legs terminating in claw and ball feet make this a very exiting and appealing chair. 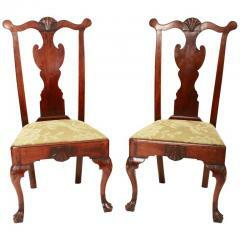 Excellent pair of walnut chippendale side chairs. Nicely carved crest rail and gothic splat, acanthus carved legs terminating in claw and ball feet. This mid modern pair of leather and chrome lounge chairs were desgined by Karl Thut of Switzerland and imported by the Stendig company. 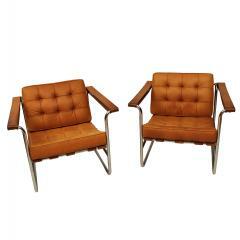 The chairs are uphostered in cognac brown leather with buttoned cushions. 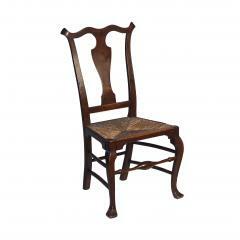 From the school of William Savery, this Maple Queen Anne side chair has a yoke crest, a solid spooned splat, a rush seat and cabriole legs terminating in "crook t" feet. This chair descended from the Ely family of New Jersey. 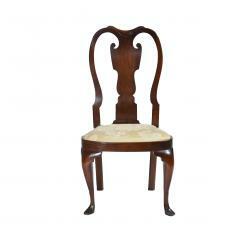 This Maple Queen Anne side chair has a cupid’s bow crest, a solid spooned splat and cabriole legs terminating in “crook’t” feet. This side chair also has a bobbin front stretcher. 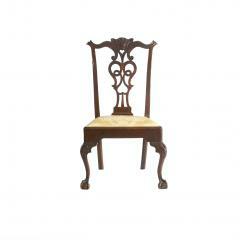 This Walnut Chippendale side chair has a cupids bow crest with scrolled ears and a carved cabochon shell in the center. It has a pierced splat, a trapazodial seat with gold silk damask, and cabriole legs with acanthus carved knees terminating in claw and ball feet. 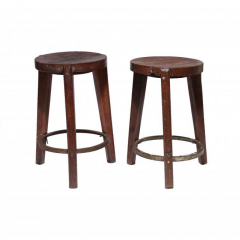 Pair of teak circular stools with wood seat, three flared legs and metal ring support. Punjab University, Chandigarh, India, c. 1965. Le Corbusier Pierre Jeanneret: The Indian Adventure, Design-Art-Architecture, Touchaleaume and Moreau, pg. 560. 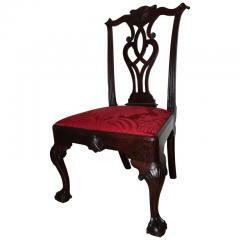 This maple side chair is attributed to William Savery. It has a cupid’s bow crest, spooned back with solid splat, rush seat, aprons and cabriole front legs terminating in “crook’t” feet. The front stretcher is bobbin-turned. 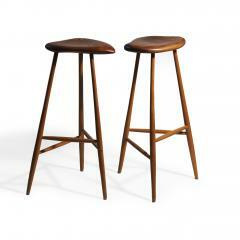 Slender turned legs with a hand carved free form seat. 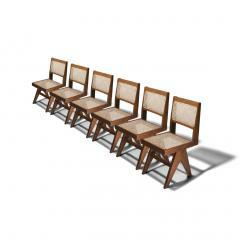 The delicate form is indicative of the simplistic and utilitarian form that Esherick is known for. 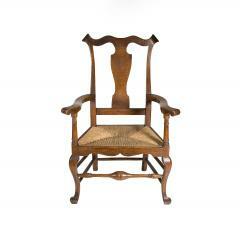 They were made by Horace B. Hartshaw, an assitant of Wharton Esherick. Signed and dated on seat. 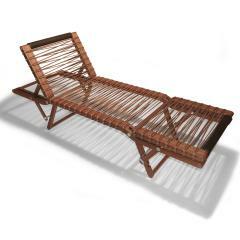 Each have a caned seat and back, V-Type flared triangular legs and stretchers. Chandigarh, India, c. 1959. Dimensions: H 33.5-35" x W 16". x D 19" x SH 17". Le Corbusier Pierre Jeanneret: The Indian Adventure, Design-Art-Architecture, Touchaleaume and Moreau, pg. 561. (PJ-SI-25-A). 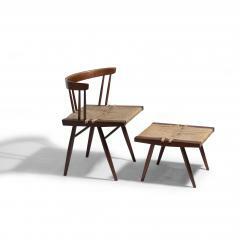 A pair of rare and desirable Pippa lounge chairs designed by Hermes. As with everything Hermes, these lounge chairs epitomize the elegance. These lounge chairs are no longer offered by Hermes. This chair has a sculptural quality to it. 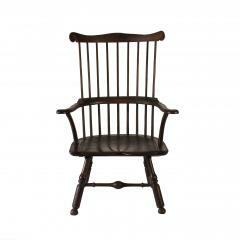 With it's old finish and original leather seat, this chair has character. 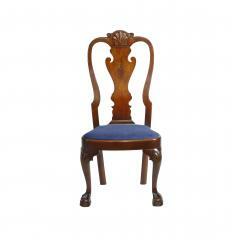 Elegant in form, this chair bears all the clasic hallmarks of the Queen Anne form. 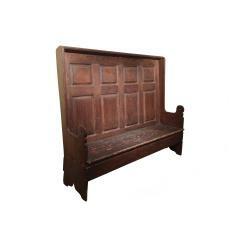 A rare example of early American craftmanship, this settle has raised panels on the back, scalloped arms and boot jack ends. 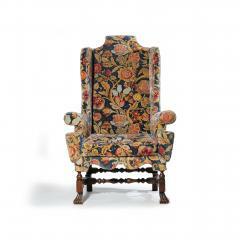 A unique piece designed to interpret what would have been an American William & Mary wing chair had one been known. Finely upholstered in a colorful "turkey-work" pattern, this wing chair has a nicely shaped crest, scalloped wings, rolled arms and an impressive base with turned stretchers and legs over Spanish feet. This wing chair makes a statement in any room. 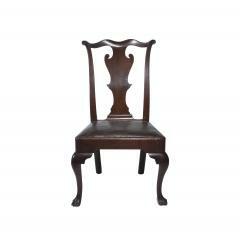 This more diminutive wing chair shows an unconventional yet successful form less consistent with it's city cousins. A flat crest is flanked by serpentine wings ending in slightly scrolled arms. The front of the seat has a slight bow shape over cabriole legs terminating in pad feet. This side chair is adorned with carving. At the center of a cupids bow crest is a finely carved cabachon over a pierced splat intersecting with a trapazoidal seat with a carved shell at the center. Cabriole legs with carved shells terminate to trifid feet. 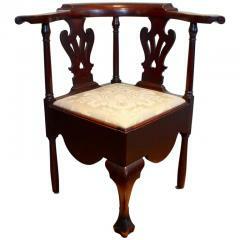 This outstanding side chair has volutes on the crest rail which descends to a solid splat with a spooned back. The balloon seat sits above cabriole legs with shells on both knees. The legs terminate in claw and ball feet. 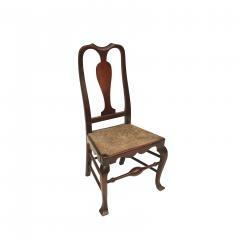 An elegantly constructed Queen Anne side chair with yoke crest, solid spooned splat and cabriole legs terminating in slipper feet. 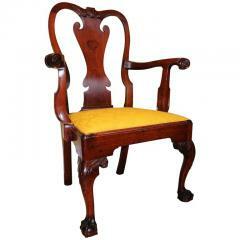 This armchair combines the elegance of the Queen Anne period with an exceptional old finish. It has a boldly carved shell in the center of a cupid's bow crest with a solid splat, nicely carved knuckle arms, a scalloped apron and cabriole legs terminating in trifid feet. 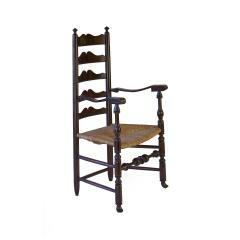 Chair with five arched slats, rush seat and turned front legs terminating in pad front feet. Front stretcher with bold ball-and-disc turnings.